(Reno, NV) September 23, 2015 – Charlotte Jorst and her horse Nintendo, the 2014 United States Dressage Federation Adult Amateur Grand Prix Champions, compete in the Rolex Central Park Horse Show this weekend. The U.S. Open Dressage Grand Prix, presented by Breyer, on Friday and the U.S. Open $75,000 Dressage Freestyle, presented by the Axel Johnson Group, on Saturday will be their first New York competitions. Charlotte, a Danish-born American citizen, is an entrepreneur who founded Skagen and Kastel Denmark, a two-time cancer survivor and an international dressage rider. As a high school student back in Denmark, Charlotte dreamed of becoming a millionaire. “I knew I needed to come to the United States to do that,” she recalls. After she got her business degree, she and husband Henrik moved to the U.S. where they worked for Danish beer company Carlsberg. After a few years, the Jorsts started their own business, Skagen, which they grew from a small watch company focused on a niche market into a multi-million dollar international business. Hard work and persistence paid off, and by 2012 Skagen was acquired by Fossil, the largest watch company in the world, in a deal valued at $236.9 million. Their adventure with Skagen became the subject of a book published in Denmark, where they are popular talk show guests and the poster couple for the American success story. She trained at home in Reno, bought international-quality horses in Europe, trained with Olympian Guenter Seidel in southern California, and competed across the country from Florida to New Jersey to Chicago. 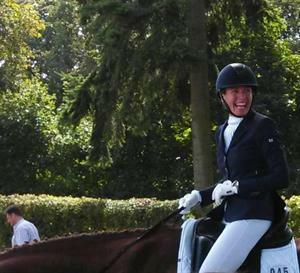 In 2013, the Danish-born American citizen represented the U.S. for the first time in Germany and this year she again rode for the stars and stripes at shows in Europe. “It felt so great to represent the country that gave me so much opportunity,” she said of her experiences riding as a U.S. citizen. Competitions can mean long weeks or months away from home, living alone in hotel rooms and missing her family. There’s also the unexpected. Riding multiple horses each day is physically and mentally tiring, as is the self-imposed pressure to continually improve riding skills and show scores. Riding and training for long hours in the sun had serious consequences for Charlotte, who was diagnosed with skin cancer, not once but twice. Named after the protective fortresses of her native Denmark, Charlotte started her brand with one shirt in UV-protective, breathable, anti-bacterial nylon/spandex fabric with mesh inserts so it was cool, and designed for stylish everyday wear as well as active sports. It proved so popular that she continues to expand her product line. From its Reno, Nevada, headquarters, Kastel Denmark distributes throughout the U.S., Great Britain, Denmark, Holland and Germany. In addition to protecting her from the consequences of a life spent so much in the sun, Kastel Denmark gives Charlotte the ability to combine her apparel business with her dressage competitions. When she’s away at shows, she often calls on retailers and she stays in close touch with the Kastel Denmark headquarters so she can make creative and business decisions on the road. The afternoon's Intermediaire I Test also ended in a photo finish as the top three competitors scored over 70% and finished within less than three-tenths of a point of each other. Ultimately hanging on for the victory was Charlotte Jorst, who was all smiles as she accepted congratulations for the win aboard Kastel's Adventure (Special D x Sunette S by Mondriaan, owned by Kastel Denmark). Ending up an incredibly close second was yesterday's Prix St. Georges winner Guenter Seidel with his Westphalian gelding Rey del Mundo (Rock Forever x Fiona by Ferragamo) on 70.789%, followed immediately by Elizabeth Ball riding Cadence LLC's Dutch Warmblood gelding Avanti (Tuchinski x Fleur by Naturel) with 70.711% for third. Intermediaire I winners Charlotte Jorst & Kastel's Adventure. Photo by Jennifer M. Keeler. "I just went for it a little more today - I wanted to go for it and see if it would happen, and it did," said Jorst, who improved on her third-place finish in Thursday's Prix St. Georges test. "Today was outstanding. Adventure had a ball and seemed at the top of his game. He's such a steady Eddie, whatever I ask of him he just does it. He loves to show and be in the ring and have people watching him." Coming off of two recent wins at the small tour in Florida, the 10-year-old Dutch Warmblood stands out for Jorst as part of an incredibly talented string of horses that she currently competes. "I really feel like we've always had a special bond," she explained. "When I originally tried him several years ago he didn't seem like much, but we just have always had a connection. He loves all the things that I love. He's like a person - I'd be married to him if he was a person and if I wasn't already married!" Like Blake, Jorst is also looking to return to Europe this year. "Adventure will go with me and we'll show in the small tour there," she noted. "I'm so excited about that because his breeder (Dhr. Naber in Holland) still keeps up with how he's doing, and they are looking forward to coming to see him compete. They're so proud of him and love him just as much as I do." See video of the winning ride on CDP Live! See complete competition results here. Sharing my fun Chronicle of the Horse interview! Kastel Denmark fans - Check out the Amateur Issue of Chronicle of the Horse featuring our company Owner and Designer Charlotte Jorst - interviewed by Sara Lieser with the theme "being fearless". What a Fun read! Enjoy! So I'm so exited that the Kastel shirts and jackets came in. We are already shipping out orders. It's just like when we started Skagen:) so fun. For all my patient face book friends we have a 20% coupon. Thank you for waiting!! Once you start wearing these shirts and jackets you'll never wear anything else!!! Use friend1013 on www.kasteldenmark.com in your shopping cart and 20% will be deducted. Coupon works once!!! Love you!! Please come take a look and shop at Kastel Denmark!
" The most exciting pair to watch today and the talk in town . . . "
America’s Charlotte Jorst on Vitalis completing their ride with a big grin and an enthusiastic salute to the crowd after qualifying for the final of the six-year-old world championships.